I thought I’d opt for a topic surrounding children and being a parent this week. And I’ve chosen Apps. We use several apps to help occupy our son while out and about and also to help with his development. Whilst I agree that children shouldn’t spend too much time on technology (tablets, phones, consoles, TV etc.) I also agree that these bits of technology are life savers sanity savers. 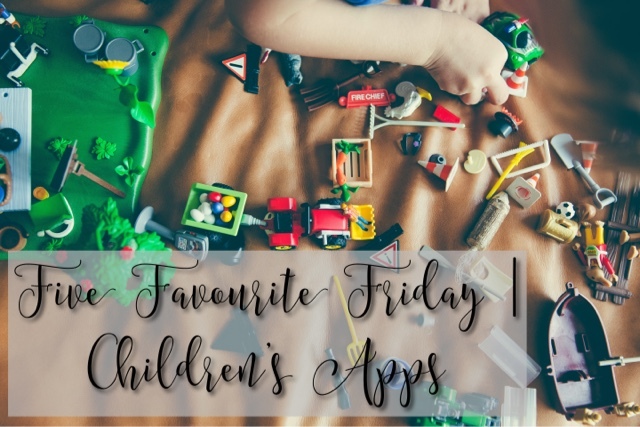 And here I’ve listed my favourite apps that I allow my son to spend time using/watching/playing. 5. Talking Carl (iOS, £0.79) – My little boy loves talking to Carl and hearing him talk back. He finds it so funny and can spend ages talking to Carl. I feel like this is really helping his speech as he’s talking more and piecing together sentences to hear Carl talk back to him. Although Carl isn’t available on Android, there is an alternative in Talking Tom Cat. 4. BBC iPlayer Kids (iOS & Android, Free) – He loves watching CBeebies, he has his favourite shows from Bing to In the Night Garden. This is a life saver while out and about as you can download your favourite shows meaning you don’t need data to watch them while travelling in the car for instance. 3. Disney Life & Disney Magic Phone ( iOS & Android, Free/£2.29) – Disney Life is along the same lines as iPlayer but with Disney Junior & Disney Channel shows as well as Disney Movies. Also allows downloads so data is not needed while out and about. Although it’s free to download it does require a monthly subscription at £4.99 per month. Disney Magic Phone is a bit pricey but my son loves video calling Mickey Mouse for a chat! 2. CBeebies Storytime (iOS & Android, Free) – my dude loves a book. He really loves storytime and will very often sit himself down at home with a book on his lap and completely ignore everything that’s going on around him! This app allows us to sit down together and read the story while interacting with the characters. 1. Star Walk Kids (iOS & Android, £2.29/£0.59) – my little man is obsessed with the moon and the stars at the minute so this app is just what I need when he wants to see stars in the middle of the day! It’s easy to use, easy on the eye and educational. I love using the app too when there is a star I’m unsure of or want to know the name of a constellation! I’d like to make an honourable mention. And this one is for Busy Shapes. This was Apple’s Free App of the Week last week and my little man loves it! It’s so good as it actually accounts for extra hands and fingers on the screen and it doesn’t interfere with how the game works. And there you have it! My top 5 kids apps! Don’t forget to pop on over to Broken Thoughts to read Tim’s top 5 and to see what our topic is for next week!